Edited by Matthew Warren, this collection of case studies puts a practical face on many of the issues discussed in its companion book Leading Issues in Information Warfare and Security edited by Julie Ryan. Published April 2013. Modern society is highly dependent on key critical systems either physical or technology based. They have become more significant as the information age has developed and societies have found themselves dependant on these systems. The issue is that these critical systems can be attacked and disrupted via Information Warfare attacks and this is the major theme of this collection of leading edge research. 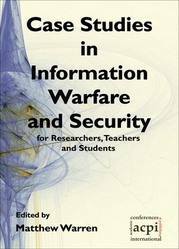 The book assesses how individual countries deal with Information Warfare in terms of protecting critical infrastructures or raising security awareness amongst a population and reflects on other considerations of Information Warfare in terms of the neutrality in Information Warfare, cooperation and the role of activism. The paper uses a number case studies and examples from around the around and particular emphasis is placed upon the Estonian Cyber War and understanding what happened, why it happened and ways to mitigate the situation. Click here to view the companion volume Leading Issues in Information Warfare and Security.